Editor’s Note: My guess is they were running tests of the SuperDraco engines that will be used on the escape system. There is an in-flight abort test scheduled using the Crew Dragon capsule that just visited the space station. That is set to take place prior to the Crew Dragon flight with astronauts aboard scheduled for sometime in July. It’s not clear what vehicle they were using today for the test. 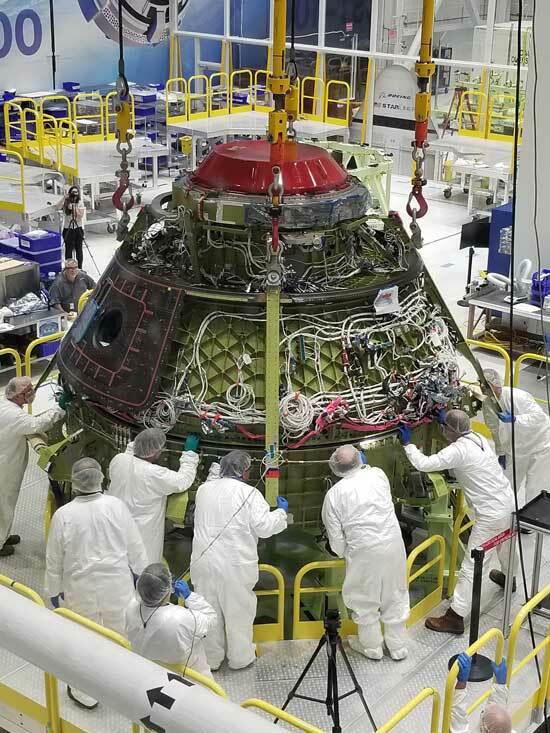 KENNEDY SPACE CENTER, Fla. (NASA PR) — NASA and Boeing have agreed to extend the duration of the company’s first crewed flight test to the International Space Station after completing an in-depth technical assessment of the CST-100 Starliner systems. NASA found the long-duration flight to be technically feasible and in the best interest of the agency’s needs to ensure continued access and better utilization of the orbiting laboratory. KENNEDY SPACE CENTER, Fla. (NASA PR) — NASA is working with SpaceX to return human spaceflight launches to American soil. The company completed an uncrewed flight test, known as Demo-1, to the space station in March. 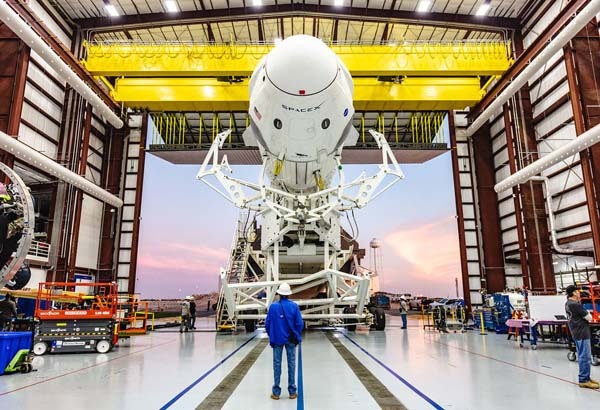 SpaceX now is processing the same Crew Dragon spacececraft for an in-flight abort test. The company then will fly a test flight with a crew, known as Demo-2, to the station. NASA’s Commercial Crew Program and SpaceX are expected to reevaluate its target test dates in the next couple weeks. Editor’s Note: Current target test dates are June for the in-flight abort test and July for the crew test to the space station. Video Caption: On the latest Watch this Space, NASA Administrator Jim Bridenstine chats with SpaceX CEO and Chief Designer Elon Musk during a tour of Launch Complex 39A just before the Demo-1 launch at the Kennedy Space Center in Florida. The historic Demo-1 mission launched at 2:49 a.m. EDT on Saturday, March 2 and was the first launch of a commercially built and operated American spacecraft and space system designed for humans as part of NASA’s Commercial Crew Program. KENNEDY SPACE CENTER, Fla. (NASA PR) — For the first time in history, a commercially-built and operated American crew spacecraft and rocket, which launched from American soil, is on its way to the International Space Station. The SpaceX Crew Dragon spacecraft lifted off at 2:49 a.m. EST Saturday on the company’s Falcon 9 rocket from Launch Complex 39A at NASA’s Kennedy Space Center in Florida. SpaceX successfully launched an automated Crew Dragon spacecraft to the International Space Station (ISS) on Saturday. It was the first flight test under NASA’s Commercial Crew program to return astronaut launches to U.S. soil for the first time since the end of the space shuttle program in 2011. 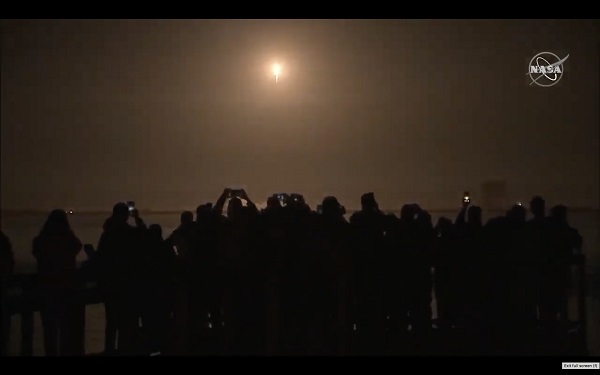 The company’s Falcon 9 rocket lifted off at 2:49 am EST from Pad 39A at NASA’s Kennedy Space Center. The spacecraft, which is carrying an instrument mannequin named Ripley, safely separated from the second stage and began a 27-hour voyage to the space station. 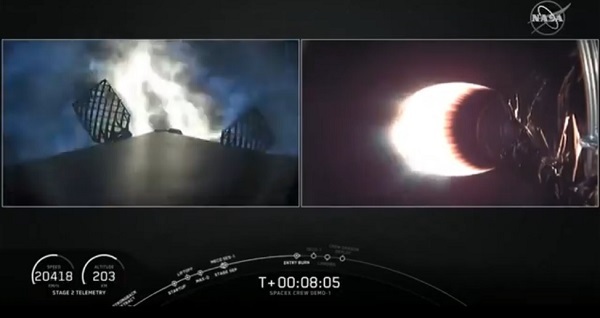 The Falcon 9 first stage successfully touched down on an off-shore drone ship. After docking on Sunday morning, the Crew Dragon will remain at the station for five days. It is scheduled to return to Earth on Friday, March 8. 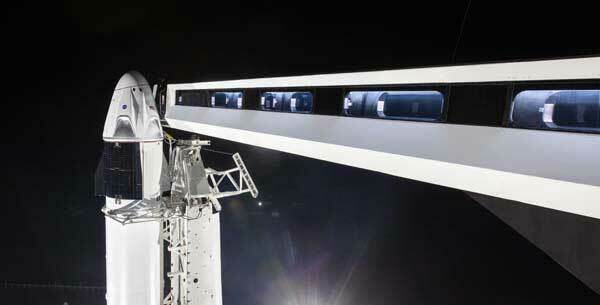 SpaceX plans to reuse the capsule for an in-flight abort test scheduled for June. This is the first of two flight tests for the Crew Dragon variant. A second flight with two NASA astronauts is scheduled for July. Crew Dragons will be certified to carry astronauts on a commercial basis. The schedule for the Crew Dragon mission is below. NASA TV will be providing live coverage of all events. SpaceX also plans to cover the docking on its website. Saturday, March 2, 4 a.m.: SpaceX Demo-1 post-launch news conference from Kennedy Space Center, with representatives from NASA’s Commercial Crew Program, International Space Station Program and Astronaut Office, and from SpaceX. Sunday, March 3, 3:30 a.m.: SpaceX Crew Dragon rendezvous and docking at the International Space Station. Sunday, March 3, 8:30 a.m.: SpaceX Crew Dragon hatch opening at the International Space Station. Hatch opening is scheduled at 8:45 a.m.
Sunday, March 3, 10:30 a.m.: SpaceX Crew Dragon welcoming ceremony at the International Space Station. Friday, March 8, 12:15 a.m.: SpaceX Crew Dragon hatch closing in preparation for departure from the International Space Station. Friday, March 8, 2 a.m.: SpaceX Crew Dragon undocking from the International Space Station. Friday, March 8, 7:30 a.m.: SpaceX Crew Dragon deorbit and landing. KENNEDY SPACE CENTER, Fla. (NASA PR) — SpaceX is set to launch its Crew Dragon spacecraft on a Falcon 9 rocket, the first launch of a space system designed for humans built and operated by a commercial company through a public-private partnership, on a flight test to the International Space Station (ISS) at 2:49 a.m. EST on Saturday, March 2. For a launch Saturday, meteorologists with the U.S. Air Force 45th Space Wing are predicting an 80 percent chance of favorable weather. Weak high pressure in advance of a front moving southeast into the area is expected during the launch window with a low probability for rain and weak surface winds and only slight concerns of any cumulus cloud or thick cloud rule violations during the instantaneous launch window. 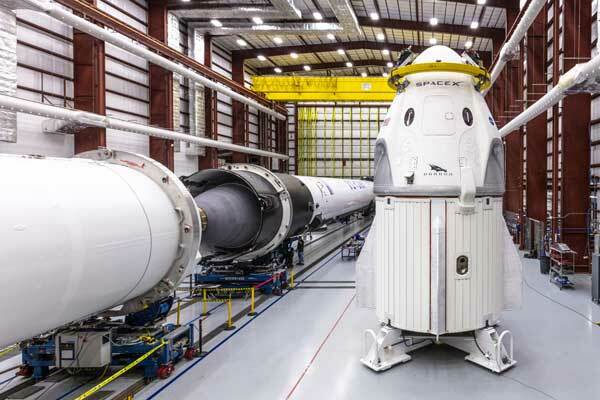 The flight readiness review for the first Crew Dragon flight on March 2 is being conducted today. A news conferences discussing the results will be webcast on NASA TV later today. SpaceX, International Space Station (ISS) Program, and Commercial Crew Program managers reviewed the work their teams have done to be ready for the Demo-1 launch. The team is midway through the flight readiness review agenda. They went through snapshots of various items reviewed and closed to meet requirements for the flight test. The board had a good discussion with the SpaceX, commercial crew and station engineering communities regarding the flight plan and redundancies built into the spacecraft systems and procedures. They additionally discussed how the data from this flight test that will be important for the next flight of Crew Dragon with NASA astronauts Bob Behnken and Doug Hurley aboard. This afternoon the board will get more detailed briefings focused on special topics for consideration and discuss human health and performance. The space station international partners also will have the opportunity to speak with the teams. Finally, Kathy Lueders, manager for the Commercial Crew Program, and Kirk Shireman, manager for the International Space Station Program, will lead a concluding discussion amongst the participants prior to a launch readiness poll William Gerstenmaier, associate administrator for Human Exploration and Operations at NASA Headquarters, will lead. WASHINGTON (NASA PR) — NASA will provide coverage of the upcoming prelaunch and launch activities for the SpaceX Demo-1 flight test to the International Space Station for the agency’s Commercial Crew Program, which is working with the U.S. aerospace industry to launch astronauts on American rockets and spacecraft from American soil for the first time since 2011. In its annual report issued last week, NASA’s Aerospace Safety Advisory Panel (ASAP) pushed back against complaints that the space agency has bogged down the Commercial Crew Program (CCP) with unnecessary bureaucratic paperwork. “It should be recognized by all parties, both internal and external to NASA, that the certification process is not merely a ‘paperwork’ process; it involves considerable detailed technical activity by both NASA and the partners,” ASAP said. KENNEDY SPACE CENTER, Fla. (NASA PR) — NASA and its Commercial Crew Program providers Boeing and SpaceX have agreed to move the target launch dates for the upcoming inaugural test flights of their next generation American spacecraft and rockets that will launch astronauts to the International Space Station. The agency now is targeting March 2 for launch of SpaceX’s Crew Dragon on its uncrewed Demo-1 test flight. Boeing’s uncrewed Orbital Flight Test is targeted for launch no earlier than April. The automated Crew Dragon vehicle will fly the first of two flight tests to the International Space Station. A flight with crew aboard will follow about five months later. 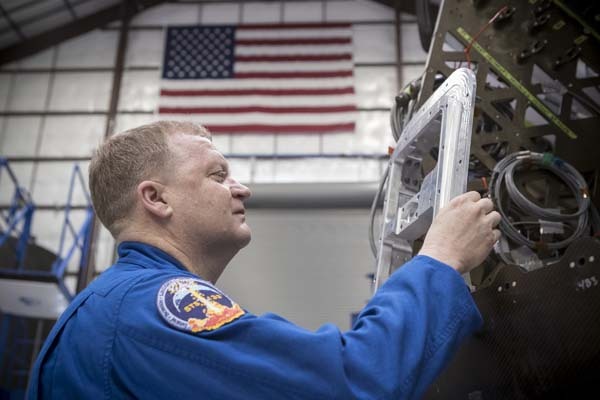 WASHINGTON (NASA PR) — NASA astronaut E. Michael “Mike” Fincke has been added to the crew of the Boeing CST-100 Starliner’s Crew Flight Test, scheduled to launch later this year. Fincke takes the place of astronaut Eric Boe, originally assigned to the mission in August 2018. Boe is unable to fly due to medical reasons; he will replace Fincke as the assistant to the chief for commercial crew in the astronaut office at NASA’s Johnson Space Center.